We are proud to be able to bring our capabilities and custom designs to numerous markets throughout the region. L & L currently serves all of northern Nevada, Lake Tahoe, Mammoth and the Bay Area. We are equipped to service Las Vegas and Sacramento as well. Our unique ideas are a beautiful fit in any home or business, whether it be a piece of furniture, new construction, remodel or a customer design. 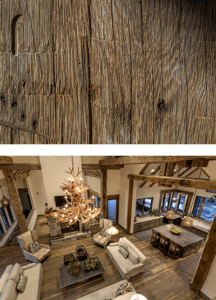 We are committed to bringing reclaimed wood designs to life. Reclaimed wood is appealing for many reasons. Reclaimed wood offers a unique, one of a kind appearance. Utilizing reclaimed wood in designs contributes to not only the beauty of the design, but also contributes to sustainable building. Reclaimed wood is often more stable and presents a more durable option than many modern lumbers. Because reclaimed wood comes from older structures, the lumber was sourced before air pollution and was most likely harvested and processed by hand. Reclaimed wood is what is known as old growth lumber, meaning that it came from trees that were able to slow grow in dense forest before settlers arrived and began competing for land use. Reclaimed wood offers stability, as it has been exposed to changes in heat and humidity for years. New lumber can often shrink or expand as it is exposed to different elements, creating changes in the final product. At L &L, we hand choose each piece of reclaimed wood for its structural integrity, patina, and practical use in your home. Because we know your project, we will help choose reclaimed pieces that will best fit your needs and style. We select from several types of wood, including American chestnut, black walnut, black locust, white oak, hemlock, red oak, heart pine and Douglas fir. We source our wood from structures that are scheduled to be demolished such as barns, homes and warehouses. Our reclaimed wood primarily comes from the northeast states and is obtained from structures that are approximately 200 years old.